Transport Minister Lui Tuck Yew: Fare Increases Have to Be Shared – True? Let’s take a look at the statistics to verify Mr Lui’s statements. 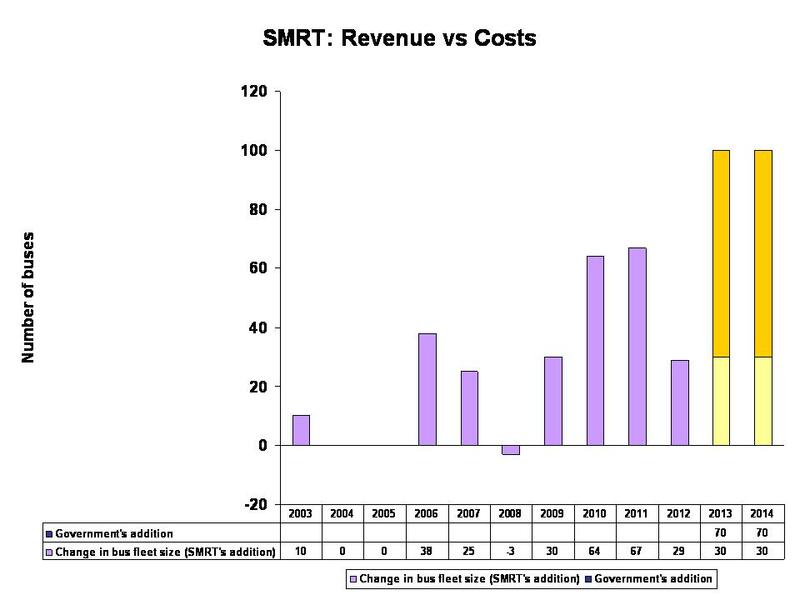 In Chart 1 below, you can see that Mr Lui is right to say that costs have risen for the PTOs, in that staff costs and energy costs for SMRT has been increasing. 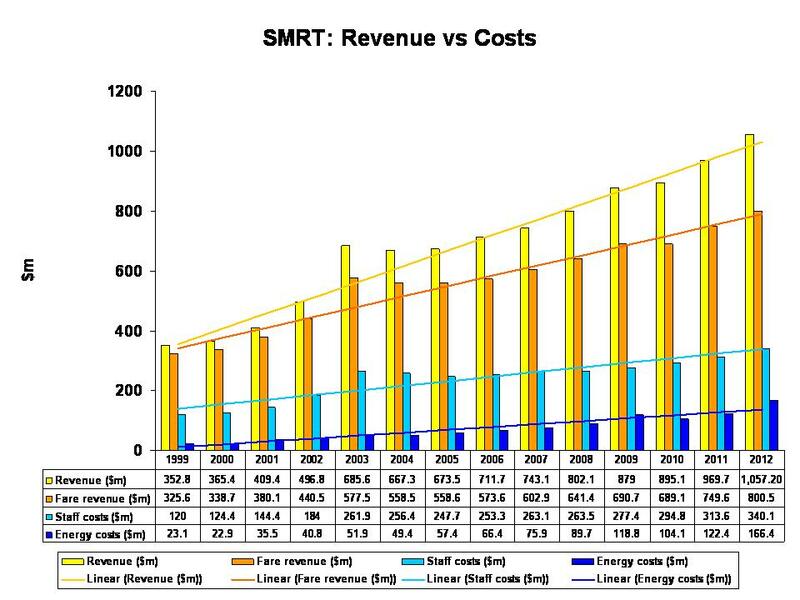 However, SMRT’s revenue has also been increasing at a faster rate. Note that the revenue refers to the total revenue. Fare revenue refers to revenue collected from fares alone. 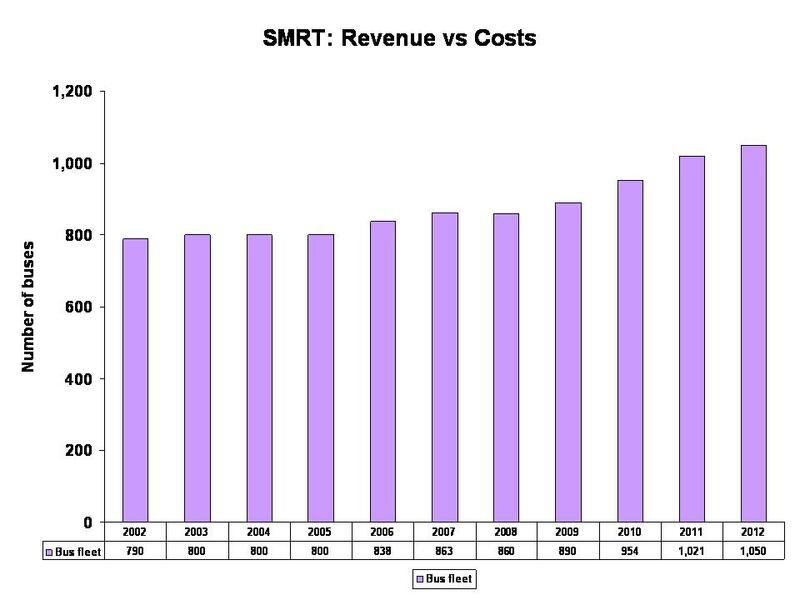 If the trend continues into 2020, you can see that SMRT’s revenue would be expected to continue to keep increasing at a faster rate than operating costs. 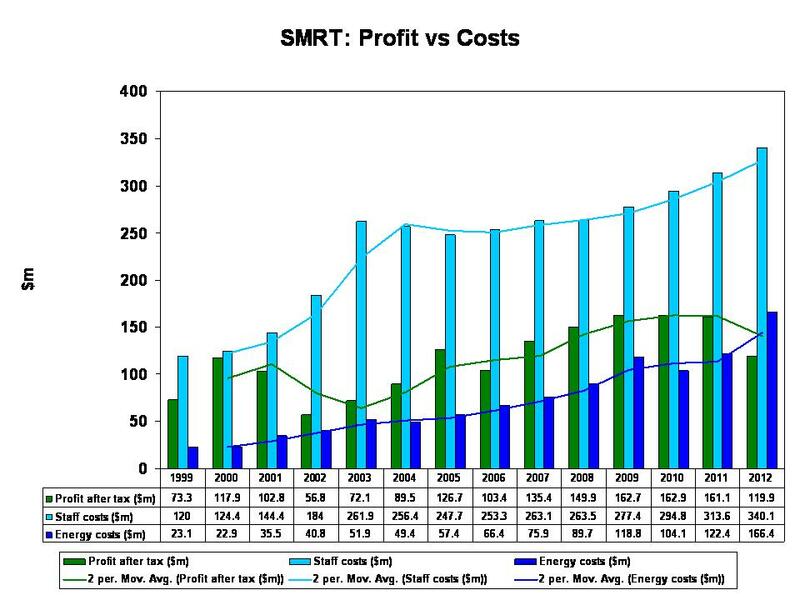 In Chart 3, you can see, however, that SMRT’s profits have decreased over the past 2 years. However, even then, SMRT has been registering healthy profits of more than a $100 million every year since 2005. I wanted to look further – are SMRT’s staff costs increasing because SMRT is hiring more people? 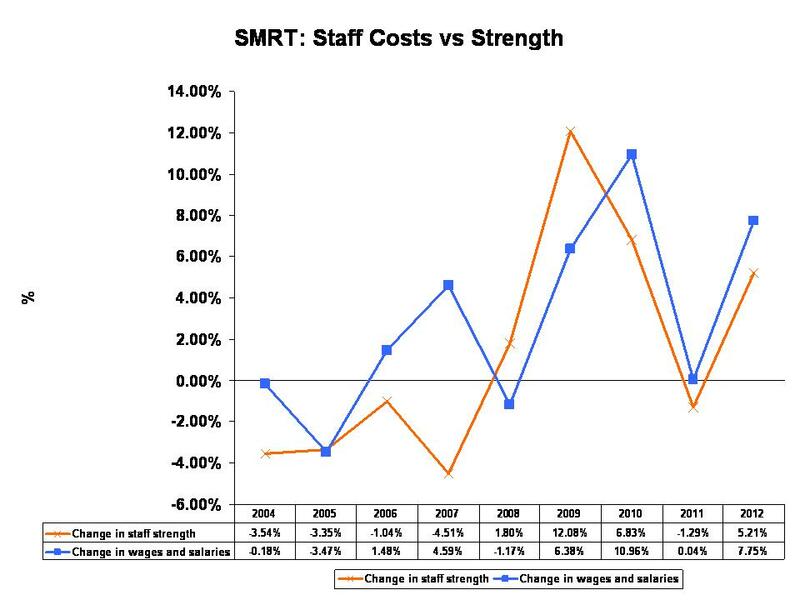 In Chart 4, you can see the comparison between SMRT’s staff strength, compared to the staff costs, and wages and salaries. The trends seem to correspond to one another. The staff costs includes costs other than for wages and salaries, such as those for training. In Chart 5, you can see the percentage changes. Again, the trends seem to correspond to one another. 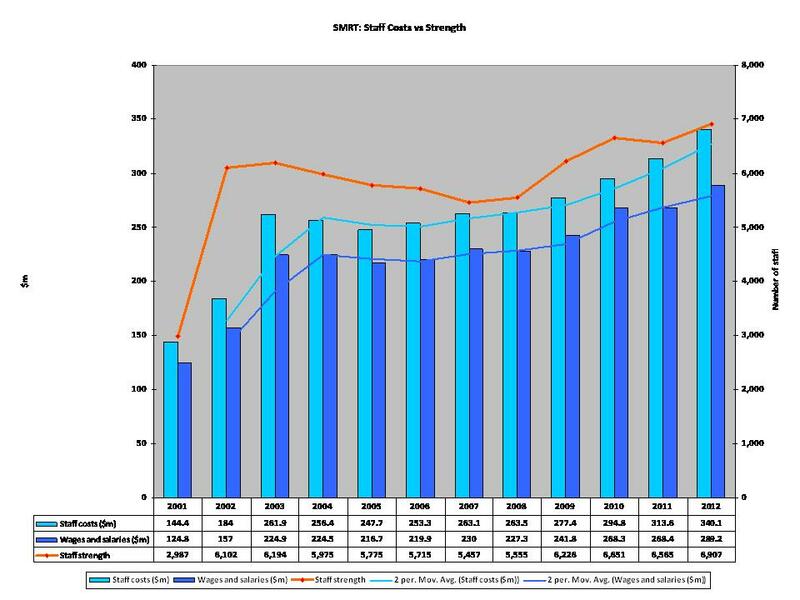 However, in the last 3 years, there were much larger fluctuations, though they would largely even out – the overall increase in staff strength from 2008 to 2012 is 4.9% whereas the increase in wages and salaries over the same period is 4.8%. However, I do have one question – why are wages and salaries increasing at an almost equal rate to the staff strength? Are there no increments to the wages and salaries of the staff? If there are increments, shouldn’t the rate of increase for wages and salaries be higher? 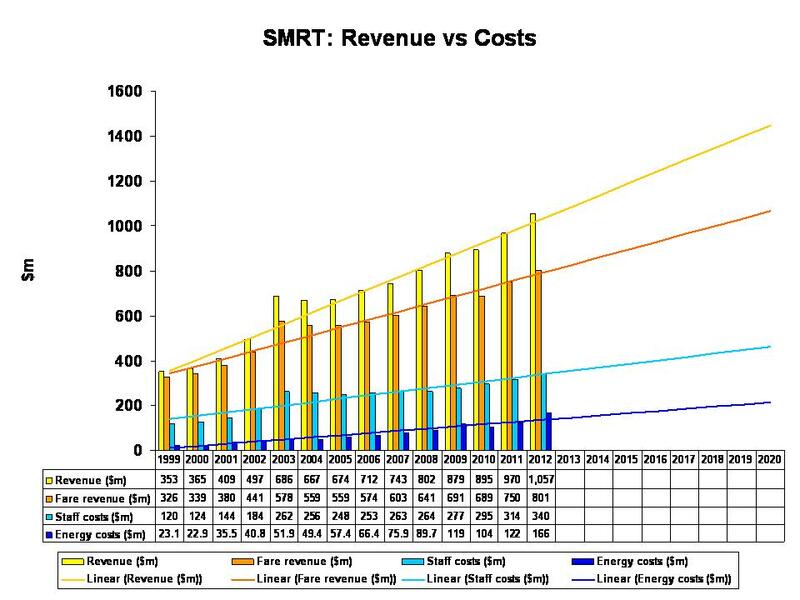 Next, I wanted to see how SMRT’s revenue changes with its ridership. In Chart 6, you can see that the trend corresponds to each other. In Chart 7, you can see the percentage changes. From 2006 to 2009, the revenue increased at a faster rate of 6.9%, compared to the increase in ridership at 4.5%. However, the rate of growth dropped in 2010 and then picked up in 2011. During these two years, total ridership increased faster at 7.1%, as compared to the increase in revenue at 5.1%. 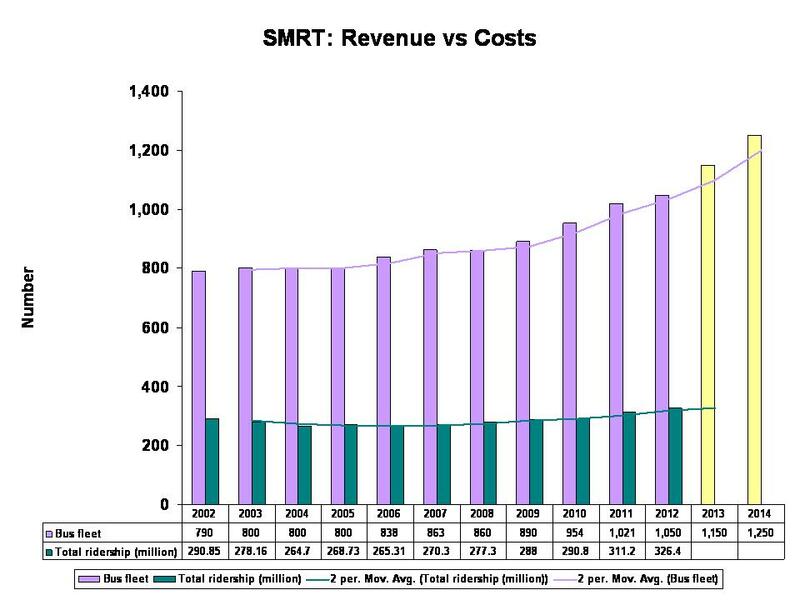 It seems that the increase in fares does not have a significant impact in increasing SMRT’s revenues, since the increase in revenue would more likely be attributed to the increase in ridership. What I do find peculiar though is that – why is it that the revenue would grow in tandem with the ridership, if fares are increased almost every year? Surely, the revenue should increase at a higher rate? I decided to thus look at the growth of SMRT’s bus fleet. 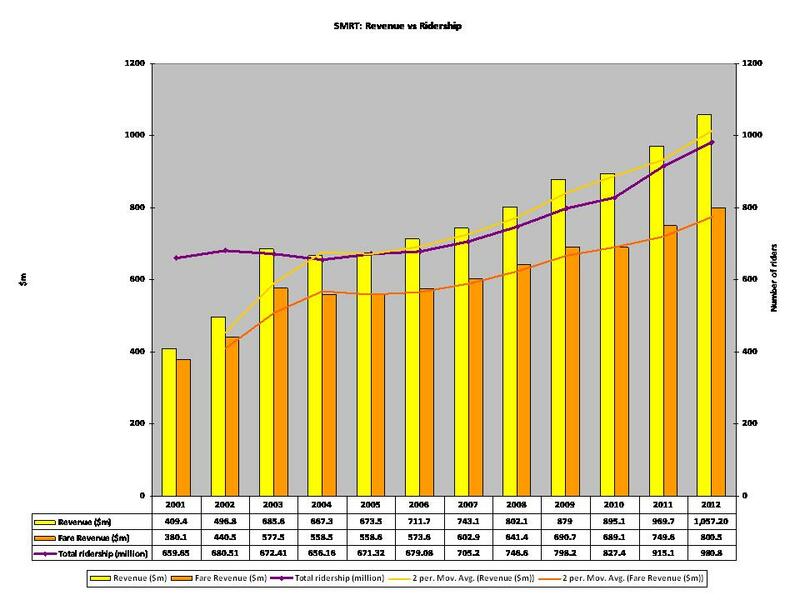 In Chart 8, you can see that SMRT’s bus fleet has increased steadily from 790 in 2002 to 1,050 in 2012. Based on the government’s plan, another 800 buses will be added by 2014. In 2011, SBS Transit has a bus fleet of 3,015 and SMRT has a bus fleet of 1,021. Assuming that the number of buses to be added will be proportionately distributed between SBS Transit and SMRT, out of the 800 additional buses, SMRT will add to their fleet 200 buses, or one-quarter of the buses. This would roughly mean that 100 buses will be added to SMRT’s fleet in 2013 and 2014 each. In Chart 9, you can see how the trend will develop if 100 buses would be added in 2013 and 2014. If you look at the increase in the bus ridership, this has been rising at a slower rate than the increase in the number of buses. Thus it looks like the government’s plan to add more buses is to not in anticipation for a higher ridership. Rather, it is to alleviate the crowding in buses that could currently be faced by commuters. This should be seen favourably. But the question is, would SMRT have been able to afford to buy the additional buses on their own? Of the 800 new buses, the government is buying 70% of the buses. Accordingly, in 2013 and 2014, SMRT would be buying another 30 out of the 100 additional buses, as can be seen in Chart 10. This is similar to the number that they had increased their bus fleet by in 2012. Yet, in 2010 and 2011, SMRT had increased their bus fleet by more than twice what they had done in 2012, and could continue to increase the revenue earned, at least in 2011. So, would SMRT be able to continue to increase their revenue, even if they were to purchase the 100 buses by themselves? It is likely that they would. But if left on their own mechanism, they might perhaps increase the bus fleet by only 30, or at most, 50. Thus the government’s strategy seems to be top up the additional buses, on top of what the PTOs would buy, according to their own estimates as to how many more buses would be required to alleviate the bus loads. The increase in fares does not seem to benefit the PTOs. It can be assumed that the increase in fares is to match up to inflation. 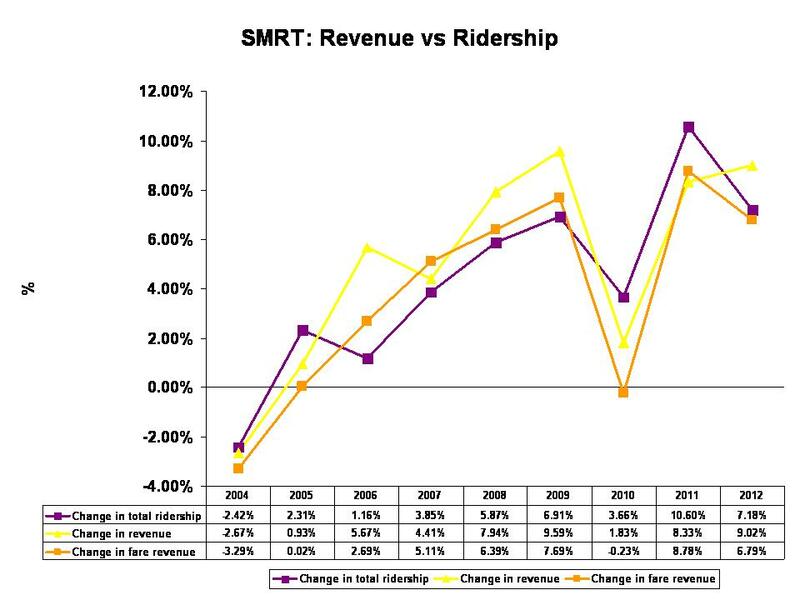 However, as mentioned, I find it peculiar why even with the almost annual increases in fares that SMRT’s revenue continues to rise in tandem with ridership. However, the wages and salaries of the SMRT staff seemed to have remain stagnant – both in terms of increments and in matching up to inflation. Finally, the government’s investment to add more buses is aimed at reducing the overloading of buses. They had most probably made some estimates as to how many buses were required to do so, how many buses the PTOs would be willing to buy, and then decided to top up with their own budget for the rest of the buses. Just by looking at the statistics, I would suggest that the government’s intention to increase fares and the $1.1 billion investment for additional buses is a sensible one. Singaporeans’ real wages and salaries have not been increasing fast enough and real median wages have remained stagnant over recent years. Thus Singaporeans do not agree that fares should be increased when there’s no parity in their wage increase. The government’s close ties with the PTOs has caused discomfort among Singaporeans. Temasek Holdings, which is owned by the government, has a 54.2% stake in SMRT. What this suggests is that the government is able to intervene in the decision-making within SMRT. However, there is no transparency as to how decisions are made between the government and the private companies that they have a stake in and thus suspicions have arose because of that. Finally, as people’s wages remain stagnant and the cost of living continues to increase, the belief among Singaporeans is that the government has intentionally depressed the people’s wages, while channelling profits into the companies owned by Temasek Holdings. Singaporeans believe that the government wants to raise fares and support the PTOs with $1.1 billion to benefit the companies, at the expense of Singaporeans, even if a look at the statistics might show that this is not the case. So, what is the real problem and what can we do about it? First, the people do not trust the government because they feel that their purchasing power has been significantly reduced. It is true that median wages have not increased. What the government needs to do is to bring wages to parity. Second, there is no transparency in how decisions are made – in the increase in bus fares and the decision to invest $1.1 billion to buy additional buses for private companies, which would be expected to fork out their own capital for investments. What the government needs to do is to explain clearly to the people how decisions were made, to allow people to understand the decision-making. Finally, Singaporeans are uncomfortable with the government’s involvement with the private companies. 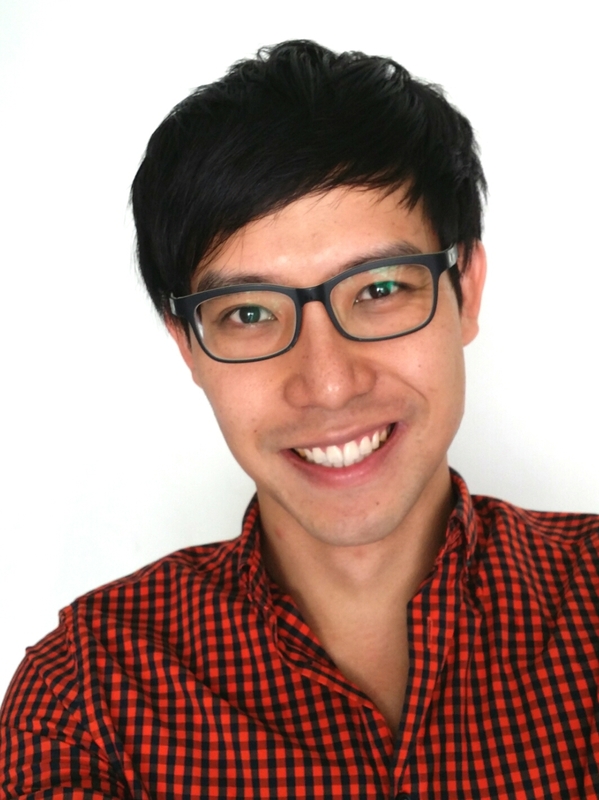 They do not know if the government will sell-out Singaporeans. What the government needs to do is to be transparent in the decisions that they make within these companies and to also show clearly how the people’s money is being used in the investment of these companies and how the returns come back and are used. As of now, there is very little clarity to this. The current problems that Singapore faces is due to a government which believes that it knows what is right and what needs to be done, and believes that it does not need to explain to the people about its actions. However, because the people feel that their livelihood is threatened, they no longer believe that the government has their interests at heart and do not trust the government. The problem is exacerbated by a lack of transparency and information access by the people on how the government makes decisions and uses their money. As such, the foundation of trust that the country needs to built on is severely weakened. A concerted effort by the government to clearly explain their decision-making and actions, and to consult with the people, needs to be complemented by a more critically-thinking population who is willing to look in more depth into the government’s decisions and actions. 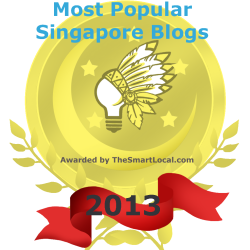 Statistics for SMRT are obtained from SMRT’s annual reports which can be found here. The analysis in this article is only accurate as far as the statistics reported have not been manipulated. Increasing Government’s Share of National Healthcare Spending to 40% – Big Deal?